Plant this heart and forget-me-not flowers will grow in memory of your loved one. 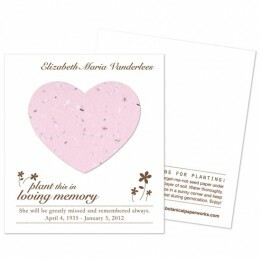 Made with eco-friendly paper, these memorial funeral cards are a unique token of remembrance. Guests can take these heart seed funeral cards home commemorating their loved one's celebration of life and watch the flowers bloom. Available in a number of plantable paper colors, these memorial cards includes the name of the person remembered, and a personalized message on the front, with simple planting instructions on the back.